YCK6602 is an elaborately designed passenger bus by Zonda with smooth and simple streamline. Its durable chassis is special for passenger bus use. The vacuum-assistant double-circuit hydraulic brake system assures the driving safety. And its pressing molding bus body and wide space well meet the requirements of the customers. 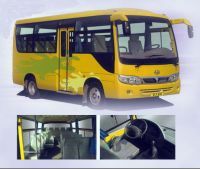 It id also equipped with new style meter table, luxury reversing monitor, molding-interior trimming, high-back seats and high quality anti-roll floor leather, which completely reflected the humanization designing concept.